Corfinium has both an unbreathably thin atmosphere and a lack of surface water making habitation by sophonts difficult. The system has a population between 10,000 and 10 million, lacking the industrial base to be completely self-supporting. It is a member of Third Imperium in the Atsah Subsector of Deneb Sector and in the Domain of Deneb. Corfinium, as a member world of the Third Imperium, holds the estate of an Imperial knight, a member of the Imperial Nobility charged with overseeing the world. Corfinium has both an unbreathably thin atmosphere and a lack of surface water making habitation by sophonts difficult. The system has a population between 10,000 and 10 million, lacking the industrial base to be completely self-supporting. It is a member of Wilds in the Atsah Subsector of Deneb Sector. 30% of the world's population is the Major Race Vargr. Corfinium was an unimportant backwater world along the great Vanguard Way that juts into Atsah from neighboring Ian Subsector. Most of the population worked in mining and light industry, or in support of the copious trade that came down the Main from the Imperial Core. The world itself is mostly desert; temperature extremes encourage the development of very fine dust that is irritating to breathe, and hard on machinery and electronics. Duststorms created by fast moving winds can move enormous amounts of this material through the air, often in units expressed in cubic kilometers, which can bury exposed objects to the depth of a meter in the course of a single night. This means the world’s oceans and rivers do not have normal basins or riverbeds, being suspended instead upon beds of silt and sediment that causes them to shift wildly during seasonal changes. Most settlements are bored into solid rock, generally mesas and inselbergs; the downport is located on the Ape Face Mesa, a rock that looks vaguely simian when viewed from space. These storms provided the raison etre for a large Imperial Army training and logistics base located in the planets desert outback. During the Imperial Civil War this facility was used as a forward base against the advance of the Dzaargh Federate. A large presence of ground and naval forces were stationed here, launching raids in retaliation against Federate raids against Denebian shipping and worlds. In 1129 the second regiment of the 688th Lift Infantry Division, and the independent 4108th Assault Infantry Regiment took over the garrison. A large stockpile of weapons and supplies was assembled on the world in anticipation of renewed hostilities with the Federate as the Civil War wound down. 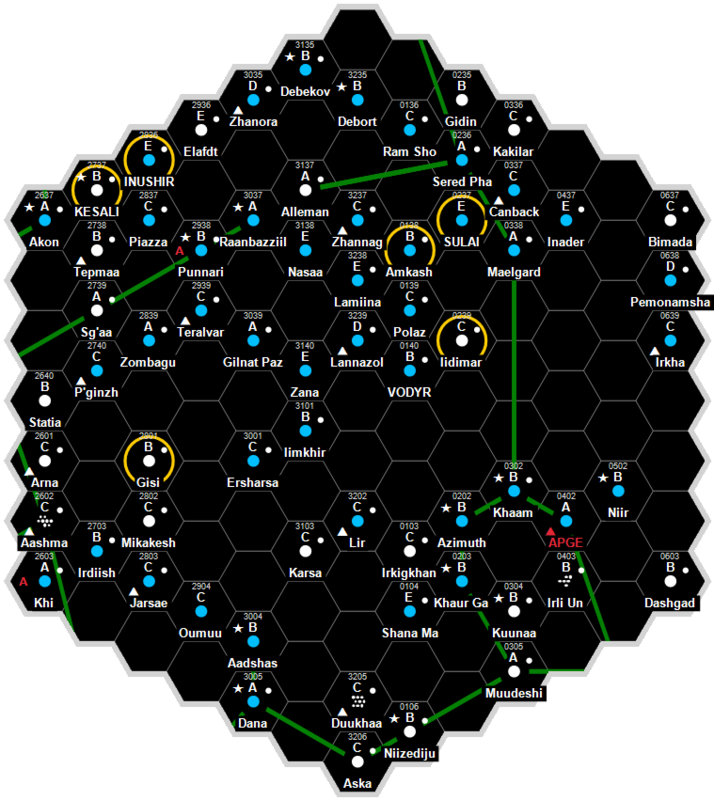 In 1131, notification of [[Virus] was received by the local cadres, along with the decision to Abandon the trailing portion of the Deneb Sector. The garrison force would now become a main line of defense, protecting refugees from Federate raiders, and holding the rear guard as Regency forces were withdrawn from the Deneb-Corridor interface. In 1133, heavy fighting with Federate forces forced the temporary halt in the evacuations of Corfinium's population. As the number of Federate raids increased, and as the first sightings of Vampire Ships along the Great Rift in Corridor were confirmed, the Regency General Staff resolved to hold the world at all costs. Because of its critical position, the garrison was ordered to "hold until position is relieved", an order conveyed from the First Regent himself. In 1139, on the heels of the Kishkii's attack on Trin, a Vampire Fleet struck Corfinium, and contact with the garrison was lost. Fearing the worst, the Regency, hard pressed elsewhere, wrote off the world, leaving it to a cold fate. Unknown to the Regency, though, the Corfinium garrison had repulsed the Vampires with heavy losses to both sides. Realizing that they were stranded, but unwilling to abandon military discipline in the face of overwhelming odds, the force dug in for a long siege. Heavy damage inflicted by the Vampires had caused the civilian administration to collapse, and the local army took over control of the world before suborning itself to the garrison. Renaming itself the Corfinium Corps, the local Regency forces have fought against Virus uninterrupted for more than sixty years. The Regency heard rumors in the early 1140s of the worlds survival, but it wasn't until 1151 that RISS contact personnel confirmed this. And it wasn't until the late 1150s that the Regency had shipping and the security presence in trailing Atsah to extricate its surviving personnel. But in all cases the Corps and its commanders refused. Citing their original orders, they would not abandon "their" world until the Regency could secure against future aggression, which was an impossible request politically to make in those days. Ever since the Corps has made its wishes known the Regency has respected its position, and on occasion carries out resupply of its depleted stocks of high-tech weapons, most notably PADs and air defense aircraft. Technically a TED, the world is commanded by the Corps commander, an officer of no higher than Major General in traditional Imperial rank. The local military is divided between a brigade sized force of TL 12-15 weapons, either preserved, salvaged or occasionally provided by the Regency. The bulk of its forces are TL 7-8, including MBTs, mass driver anti-aircraft artillery, fast hover attack craft, jet-propelled aircraft and rocket powered spaceplanes. The entire world is run as a military encampment. Every member of the populace has a prescribed role in the local defense of the world; every job and profession is covered and regulated by the local military command and its regulations. Living quarters are assigned, and travel outside of movement necessary for duties is heavily controlled. Despite the high law level, every adult member of the population must carry a weapon in public at all times, and each home must be equipped and barricaded for eventual hostilities. Private transport is prohibited, and curfews are enforced by military police. Despite the paranoia of this world, the population has access to universal medical care, subsidized education and a number of other luxuries undreamt of on most Wildside worlds. In addition to normal subjects, children are given mandatory instruction in weapons, tactics, military discipline and even survival by school instructors. Children as young as fourteen are inducted into local military lagers for basic training, and the best and most talented are elevated out into advanced technical schools that teach them engineering, medicine and advanced high tech armaments. On very rare occasions a highly promising recruit is Passed to the Regency for training in safeside military schools. Upon reaching their majority, the local cadets are divided by their aptitude into their different specialties, with the smartest being commissioned as officers. The local Vargr population is a remnant of both heavy Dzaargh Federate raids, and of refugee flows during the Collapse. Despite the previous period of nationalist and racial hatred, the two groups are fully integrated and are equal partners in the defense of their world. One Vargr officer, Goeggzorrgh "the Hellhound", even rose to Major General during the period of 1177-1188. Official Regency opinion on this world is divided. The extreme conditions that this world and its culture developed under are not wholly suitable for reintegration into mainstream society, and the local officer corps contains hardliners who resist that possibility. The current Major General, Horash "Packula" Packard is a self described extremist who seems to be somewhat unstable, especially in regards to reunification with the Regency. This page was last modified on 22 April 2018, at 07:52.